Alamo Heights is a first-ring suburb of San Antonio with fine neighborhood structure, strong connections to nature, a variety of pedestrian-oriented streets and excellent housing stock. San Antonio’s sprawling growth has swallowed Alamo Heights, however, and the streetcar that once connected it to the city core was replaced by a six-lane urban highway. Typical suburban zoning standards have badly damaged the original neigh­bor­hoods to the east of Broadway and the downtown is now merely a com­mercial strip that cuts the town in half, characterized by buildings of very mixed quality. Collaborating with City staff and local designers, Moule & Polyzoides developed a plan for a one-mile long corridor to transform the area into a real urban place. Streets are recast as urban avenues with wide sidewalks, landscaped medians and a streetcar, and plans for developing mixed-use and multi-family buildings supported by transit and a park-once district are now in place. 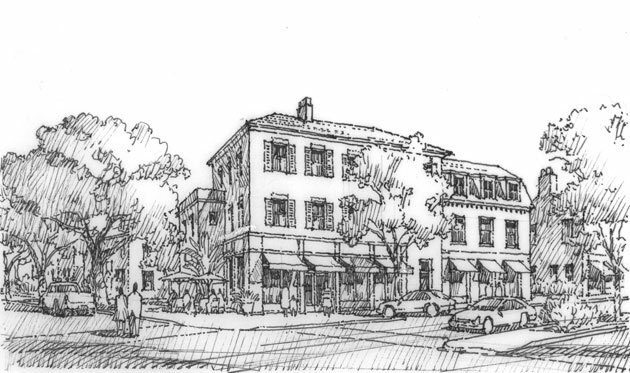 The streetcar, an extension of the line initiated in Moule & Polyzoides’ plan for River North, connects Alamo Heights to downtown San Antonio, and is key to creating an active, walkable place at the center of town.